Hedges can be a beautiful and functional part of any garden. They can have many purposes, and it is important to first decide what your purpose is before choosing your hedge and planting it. Is it for privacy, security or decorative purposes e.g. to fit in with a formal garden style? How high do you want it to be? How much effort do you want the pruning to be? What width of hedge would you like and would you like it to be all the one plant type or mixed ... with different plants that could offer a seasonal point of interest such as flowers or different coloured foliage? These are all important points to consider before launching into hedging. Not so surprisingly a huge number of plant varieties can be pruned into hedges. One approach is to look at what works in gardens in the neighbourhood. However, you may decide you want to try something different. Select plants that typically would grow to least the desired hedge height alone in the open. As a general rule, plants should be spaced at one third the ultimate desired hedge height to avoid gaps at the base of the hedge. The exception to this rule is if the plant chosen has a column growth style. For example if you want a 2 metre high hedge to cover a fence you would typically plant them 2/3 metre (approx. 60-70cm) apart. Sometimes it is worthwhile buying a couple of extra plants and keeping them in pots in case some of your earlier planting needs to be replaced with matching plants. 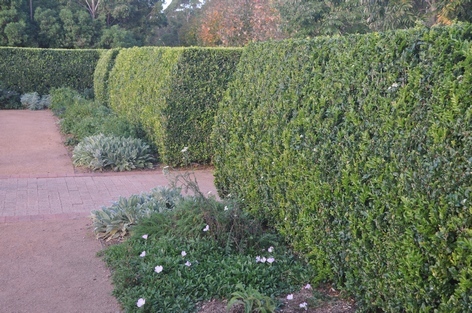 Hedges may be planted in straight lines or curves. Prepare the ground for the plants as for any new garden bed. The first and last plants will be planted half the spacing distance in from the ends of the hedge. Mark out the site to locate the hedge (a string line or hose may be useful) and start planting the hedge. Plant your hedge plants, and water in using some diluted seaweed extract. Install your irrigation lines and apply mulch around your newly planted plants keeping it away from the stems. In order to achieve a dense foliage growth with your hedge the plants will usually need to be clipped regularly early in spring and autumn. New growth may be burnt by frost in winter or by heat in summer. Shape the hedge so that it is slightly wider at the base than the top (more like an A and not a V shape). A wider base means light has a better chance of reaching all the leaves. Good luck with your hedge planting.